The origin, purpose, functions, and affiliations of the Amberg Historical Society. Alphabetical list of persons buried in the Amberg Cemetery. Online catalog of some of the museum collections and exhibits. Contact and membership informaton; hours of operation. Answers to questions about the historical society and membership. Features and services of the Amberg Museum Complex. 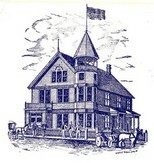 Connect to sites associated with the Amberg Historical Society. Current activities and projects, society announcements, and other news. Publications of the Amberg Historical Society available at the museum. Listen to some of the stories heard at the Amberg Museum. Explore the Amberg Museum Complex online.